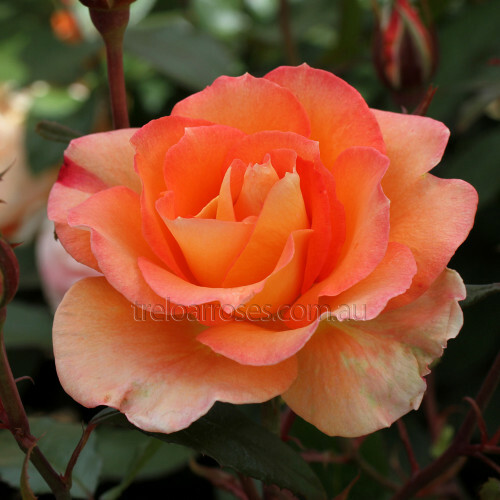 (KORtifar) - This distinctive variety will make an impression with its very attractive colour combination of deep apricot and orange tinged pink flowers that have a yellow reverse. Large blooms are produced freely in clusters on a very healthy, vigorous bush with glossy foliage. The petals of the slightly fragrant blooms take on a ruffled appearance as they age. Decorated with international awards including "Golden Rose" at the Baden-Baden Trials and Bronze Medal at the National Rose trial Garden of Australia 2011. 1.2m tall.